Comprehensive on-line monitoring enabling full remote diagnostics and assured decision making. 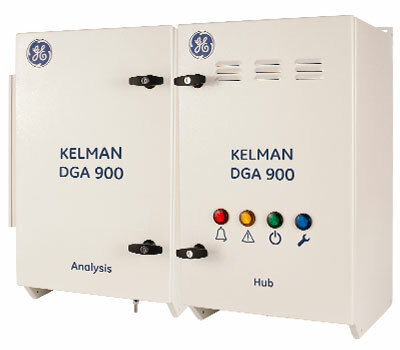 Kelman DGA 900 On-line DGA device monitoring all 9 fault gases plus moisture. The Kelman DGA 900 features an innovative two enclosure design, local/remote HMI and expandable analog/digital I/Os. TRANSFIX DGA 500 On-line DGA monitoring device that measures five individual dissolved gases and moisture and provides both on-line monitoring and key exploratory diagnostics. Kelman TRANSFIX On-line DGA device monitoring all 9 fault gases plus moisture. Features load sensor, inputs/outputs, configurable alarms and extensive communications options. Kelman MULTITRANS Special TRANSFIX version for monitoring 3x side-by-side single phase transformers. Kelman TAPTRANS Special TRANSFIX version offering DGA of the main tank and the OLTC (On-Load Tap Changer) selector and diverter tanks. Kelman MINITRANS Entry level discrete gas DGA device monitoring 3 significant fault gases plus moisture. Kelman TRANSPORT X2 Compact portable system that is designed for laboratory quality Dissolved Gas Analysis (DGA) on manually taken samples from transformers filled with mineral oil and ester fluids. It allows fast diagnostics in less than 30 mins through an improved graphical touchscreen user interface.